Please read through the 2018 rules as some changes have been made in several categories. These changes have been recommended by our judging coordinators and the AIC Committee, and should make the entry process easier for submissions as well as offering some new award opportunities. We also have some new judge coordinators this year, so be sure to completely read through the 2018 rules before submitting your work. DANVILLE, Ala. (June 26, 2017) – Each year, thousands of hunters are injured in treestand accidents. In fact, according to the Treestand Safety Awareness Foundation (TSSA), there are about 4,000 emergency room visits per year due to treestand falls. Of those visits, an average of 23 result in a death each year. While the number of fatalities from treestand accidents continues to decline, the ultimate goal is still zero. 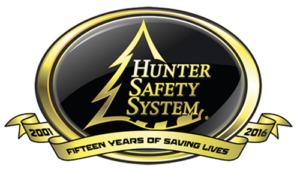 In an effort to meet that goal, Hunter Safety System, the industry leader in treestand safety, is asking AGLOW (Association of Great Lakes Outdoor Writers) media members to raise awareness about the importance of proper treestand safety through their professional outlets. In return, HSS will present cash awards for the top three-published/aired treestand-safety stories. This contest will begin immediately and will run through Sept. 1, 2018. Winners will be announced at the 2018 AGLOW conference at Bismarck, North Dakota. Prizes will be $500 for first place, $250 second place and $100 for third place. All published/aired stories need to be submitted to Karen Lutto at Karen@hunteroc.com by midnight Aug. 31, 2018. Submissions must be written and published between June 16, 2017 and August 31, 2018. “All treestand accidents are preventable,” said Jay Everett, marketing manager. “We hope that by partnering with the media to promote safety measures when hunting from a treestand, we will educate more people and help them avoid serious injury or a fatality. Any active AGLOW media member is welcome to submit published/aired pieces of work. For additional information or questions, please feel free to contact Lutto at 830-755-4308 or email Karen@hunteroc.com. You may join us before you write, FREE FISH CAMP Invitation! Free. Sign up with direct entry to CCVB (email below). Need to Know More About Chautauqua County? Join Us at FISH CAMP 2018! Free Invitation. 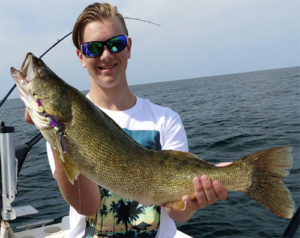 Fish camp trips will target giant musky and largemouth bass on Chautauqua Lake, monster walleye and smallmouth bass on Lake Erie, Lake Erie jumbo yellow perch, steelhead in several of our many tributary streams and there is crappie fishing fun too. Your only requirement is to get yourself to the Fish Camp location we will provide to you. We’ve got you covered. For this writing competition, tempt us with your creative outdoor story. Deliver a sense of urgency to join the fun of any Chautauqua County outdoor adventure with your compelling message. Your story can be about fishing, hunting, camping, hiking, kayaking, boating or anything outdoors, including our grape country – wine tasting, hops farming (microbreweries), etc. Please email submissions as a PDF, if possible. No limit on number of submissions. To request a reservation for the free Fish Camp trip, contact Dave Barus at dbarus35@yahoo.com or call 716-597-4081 directly. Email contest entries to Andrew Nixon.